The European Union has formulated ambitious CO2 reductions and energy efficiency goals for the next decades. The potential of the housing stock to contribute to these savings is considered to be significant. In 2050 the built environment is expected to be nearly carbon neutral, with greenhouse gas emissions 88-91 % lower than in 1990. To track, steer and control the process to attain these targets, knowledge about the characteristics of European housing stocks, their current energy performance and the dynamics in refurbishment is necessary. 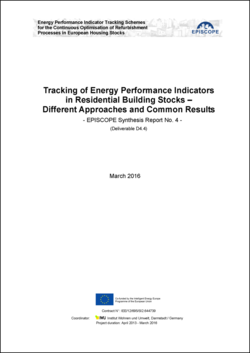 The EPISCOPE project aims to respond to these requirements by tracking the implementation of energy saving measures in residential building stocks as well as their effects on energy consumption and greenhouse gas emissions. Building up on the experiences and findings on building typologies during the TABULA project, the scope was extended towards the elaboration of building stock models and scenario calculations to assess refurbishment as well as energy saving processes and project future energy consumption. A long-term objective is to install regular bottom up monitoring procedures for building stocks. The EPISCOPE Synthesis Reports No. 2 and 3 (SR2 and 3) document methodological aspects and selected results of the scenario analyses. 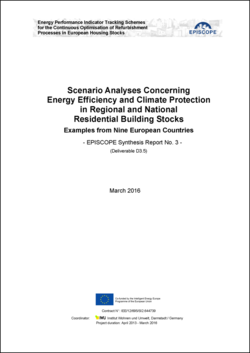 SR2 covers scenario calculations conducted for local residential building stocks, wheareas SR3 includes results for regional and national residential building stocks. Thereby, the objective of the scenario analysis is not a prediction of future energy demand in the respective building stock. Rather, the objective is to show the potential future impact of predefined assumptions. This may help respective key actors and policy makers to decide on strategies and policies for transforming building stocks towards carbon dioxide neutrality. 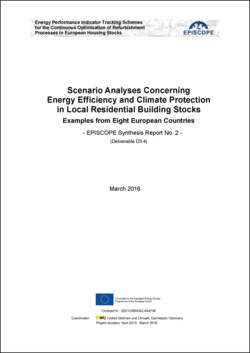 The reports start with a description of European climate and energy targets for the building sector, and document the building stocks observed as well as the individual scenario approaches and results. They conclude with summaries of the main findings and conclusions. Furthermore, data and energy balance calculations referring to the current state of the building stocks considered are included in the TABULA WebTool. Synthesis Report No. 4 highlights the individual procedures to collect the necessary data and information for building stock monitoring and modelling.